I've got pumpkins on the brain big time right now. My sister and I are planning a pumpkin picking trip for this coming Monday, which I am so excited for! Every year I decorate my pumpkins in a different way so I've been trying to decide what I'm going to do this year. I saw this on Pinterest and loved how simple, yet chic these pumpkins look. I'm still not sure what I want to do for mine, but I will definitely be keeping this look in mind! If you would rather buy already decorated pumpkins instead of making them yourself, you can get these beauties here. How gorgeous is this manicure from Essie?! It's perfect for fall and features beautiful colors that can be worn all through the season. For the full step-by-step tutorial click here. I have been seeing suede moto jackets everywhere recently and am LOVING them! They are so pretty and suede just seems so fall to me. Moreover, a suede jacket is perfect for this time of year and fall weather. To make if feel even more seasonal get one in a classic fall color! I'm loving this, this, this, and this. I am a huge fan of dark lips, especially for fall and winter. They've been a favorite trend of mine for about two years now and they're still going strong. I love a makeup look like the one below - glowing skin, a neutral eye look, and then dark, vampy lips; it's gorgeous for this time of year. My favorite dark lipsticks are this in Black Cherry and this in Train Bleu. This living room is seriously a dream come true for me. 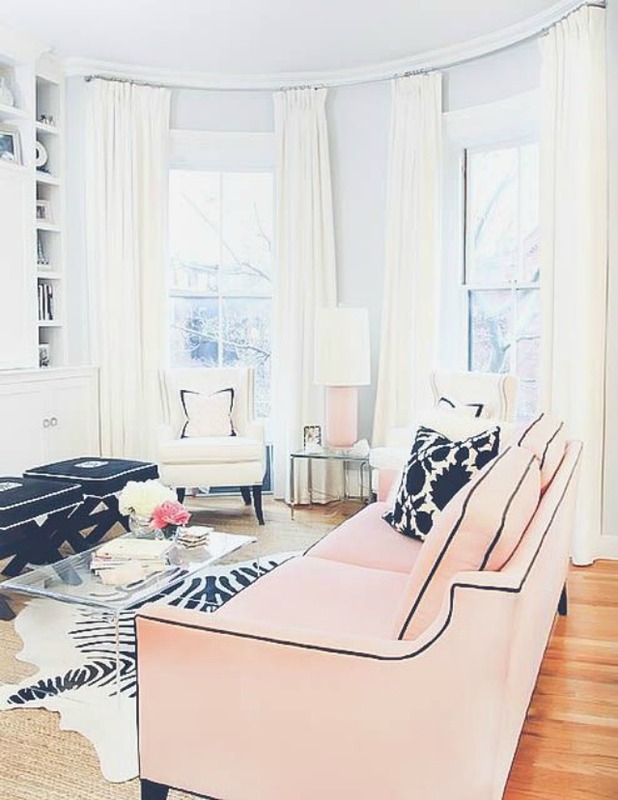 It is so feminine chic and I am absolutely in love with that pink couch. I am still working on decorating my bedroom and have been looking at decor inspiration like this to create a space I love. Today I'm linking up with Friday Favorites, Friday Favorites, Fab Favorites, Oh Hey Friday!, Five on Friday, and Friday Favorites. Ugh dying to do a pumpkin like that too! Such cute favs! Dark lips are my favorite in the fall and winter. My husband hates it but oh well! Those pumpkins are gorgeous! I've always been afraid to try out a dark lip but maybe autumn is the town! Always looking for mani inspiration and this one looks adorable (and easy)! That Essie manicure is so pretty, I need to get back into trying nail art! Everything in this list is spot on! That jacket is so beautiful. And that living room space is perfection! Have a great weekend! The writing on the pumpkins is so pretty. Makes me want to work on my own. I love how those pumpkins look! I might have to do that this year. That nail polish is so pretty too! Great for fall. Omg that manicure is absolutely stunning!!!! I got a suede jacket during the Nordstrom Sale and I love that it's staring to cool down, so I can finally whip it out! 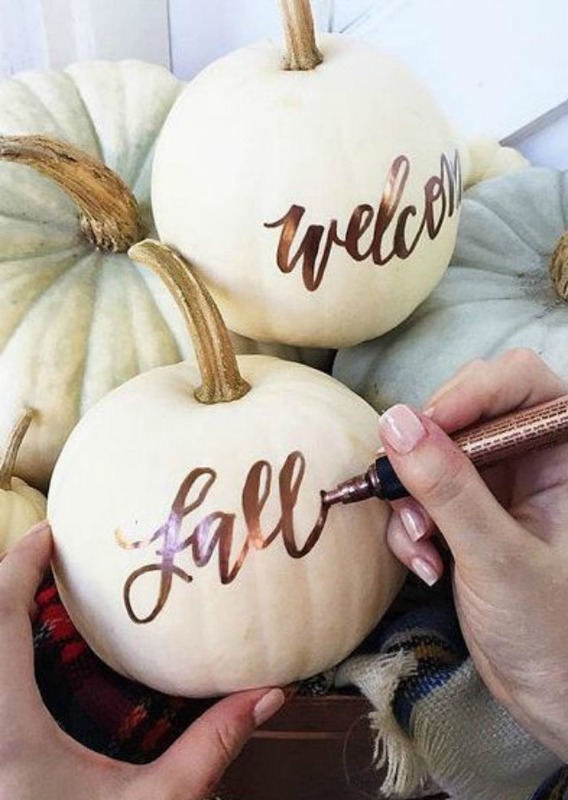 Those pumpkins are perfect and I'm in LOVE with that mani! Fall! So happy it's hear. I love those pumpkins, such a cute and simple craft. I also love the jacket! Need that in my closet. Oh I love that manicure! I usually get my nails done so unfortunately my nails haven't seen as many DIY manicures lately. I love that suede jacket too!